With grain prices dipping after several years of escalation and net farm income down by nearly a third in 2014, land-renting farmers in the Midwestern United States are left in a bind as landowners seek payments by March 1. 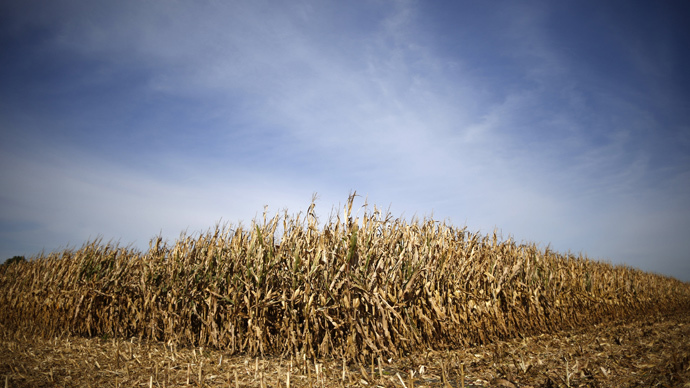 Midwest grain prices are at a four-year low following theFarm Belt boomof recent years. US farm incomes will drop 32 percent this year, according to the US Department of Agriculture (USDA), the lowest level since 2009. Net farm income topped out at $129 billion in 2013, and is expected to drop to $74 billion, the USDAreportedthis month. Lower prices and income mean farmers of all stripes are scrambling to maintain their holdings. According to Reuters, many farmers with land leases are resorting to desperate tactics to appease landlords, seeking restructured contracts that may subject them to damaging legal battles if an agreement is not made. At least 40 percent of farmland in the grain-and-corn-growing Midwestern plains areas in the US was leased or rented out as of 2012, the USDA has claimed. Many of these renters face a March 1 deadline, even as input costs – for fertilizer, seeds, and the like – remain high. One real estate expert in Iowa – the top corn and soybean producer in the US – told Reuters that 1,000 or more farmland leases out of an estimated 100,000 total in the state could be breached in the coming months. Some landowners are renegotiating, while others are seeking new tenants. The situation portends further concentration of power in an industry that has increasingly operated in recent decades through corporate standardization and consolidation. The boom that many farmers saw in recent years may come back to haunt them, as profits have translated to new machinery and additional buildings, for instance, that indicate to some landlords that rent payment is within reach. "As cash rent collections start this spring, I expect to see more farm operators who have had difficulty acquiring adequate financing either let leases go or try and renegotiate terms," said Jim Farrell, president of Farmers National Co. The possibility of breaking leases has some landlords preparing legal action, Kelvin Leibold, a farm management specialist at Iowa State University extension, told Reuters. "People want their money. They want to get paid. I expect we will see some cases going to court over this," he said. Many farmers have turned to banks for operational loans, which jumped to $54 billion in the fourth quarter of 2014, a 37 percent increase compared to one year ago, according to the Kansas City Federal Reserve’s new Agricultural Finance Databook. Farm loans with no specific purpose almost doubled to $25 billion in the fourth quarter of 2012 compared to last year. Overall, non-real estate farm loan volumes increased by more than 50 percent for the fourth quarter, to $112 billion, Reuters reported. As for grain agribusiness giant Archer Daniels Midland Co., its quarterly dividend increased by 17 percent. The company’s net earnings for the fourth quarter of 2014 hit $701 million, while the segment operating profit was $1.26 billion. As corn prices were down, Archer Daniels Midland’s corn processing operating profits, though down slightly, still stood at $284 million “when adjusting for the net impacts of asset impairment charges and hedge timing effects,” according to MarketWatch.